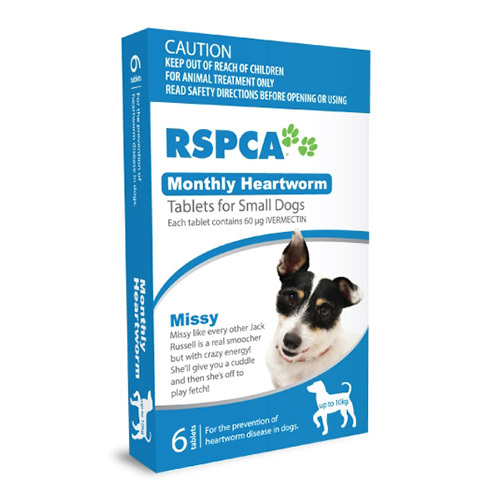 RSPCA Monthly Heartworm tablet is a generic heartworm preventive. The monthly dosage protects your dog from dangerous heartworm disease. Destroying immature stages of heartworm infection, which has infected one month ago, it protects your dog from heartworm infection. The generic heartworm tablet is highly effective in preventing the disease when given monthly. Available in different packs based on dog's weight, the tablet is easy to dose. The oral treatment is approved for puppies above 6 weeks of age. Start the treatment during the period of the year when mosquitoes carrying infective larvae are active. Give initial dose starting the month of the first exposure to infected mosquitoes. To control heartworm infection continue treatment for 12 months. The final should be given within the month after the last exposure to mosquitoes. When replacing other heartworm preventive with RSPCA heartworm tablet in a heartworm preventive programme, provide the first dose of RSPCA monthly heartworm tablet within a month after the last dosage of the former medication. Weigh your dog and select the RSPCA heartworm pack accordingly. Provide one tablet for each 10 kg of bodyweight. Give it orally or mix the tablet in food. Ensure your dog finishes the meal for complete dosage. Strictly for animal treatment only. This product must be administered MONTHLY to prevent heartworm infection. It is recommended for use all year round. your pet is older than 8 weeks of age when you start using this product one of the monthly doses is missed or is late by more than 1 week. Caution: Collies including Border Collies and other breeds have genetic intolerance towards Ivermectin. Those pet owners with Collies and other susceptible breeds should look for alternatives to Ivermectin for the treatment of parasites. This product was introduced to me by my vet. Then later on I found it on this site at a very cheap price and started buying from here. Must say, it is a great site, have all the products my pet uses and I have never faced any problem regarding the efficacy of the products. This monthly heartworm preventive is a very effective treatment in preventing heartworms from my dog. I am extremely happy with this product. Thank you!!! An effective oral heartworm preventive treatment!!! It has been several months since I have been getting this effective heartworm preventive and the results have been amazing. My furry pal has not shown any signs of heartworms and this treatment has been doing an excellent job. Thank you.